More than 60 minutes of accredited professional development for teachers presented by Lauren Fairbairn. 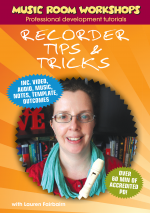 Suitable for music teachers looking to set up or improve their recorder program. Loads of tips, tricks and techniques for engaging your recorder players, keeping them engaged and assessing/recording them. Games, activities, songs and fun ways to teach skills and techniques – and to keep your students practicing those skills and techniques! Join author and presenter Lauren Fairbairn as she steps you through setting up a program, first lessons, continued lesson norms, assessment and reporting, performance hints and much more. AND – no experience is required for this journey: all notes, charts, proformas, music and audio are provided. Developing music skills and understanding the music elements – such as pitch, rhythm, timbre, dynamics, tempo etc. Teaching the value of teamwork, utilising cooperative learning and showing the importance of rehearsal.